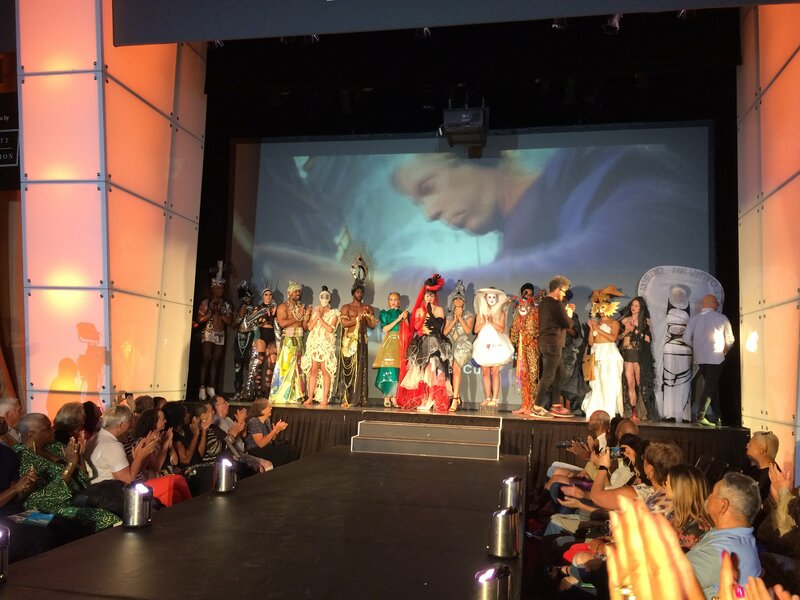 Designers in Cuba are reinventing fashion with plastics and other recycled materials. It’s Sunday, May 12, and the dressing room at the Kennedy Center in Washington, DC, is abuzz with energy. Celia Ledón, the designer of three of the outfits, sits in the dressing room next to the models — watching, discerning — as they, one by one, stand to practice their catwalks. Ledón is small and unassuming, with blonde-tipped curly hair and a tight-lipped expression on her face. It’s easy to tell which dresses Ledón has designed. That’s because all of her outfits have been fashioned out of reusable materials. One top, which looks like the chainmail beneath a knight’s armor, is made from the metal lids of soda containers. Another dress is made from bed sheets strung together. The third outfit is assembled from yards of black fishing tarp. Ledón created 10 dresses in all for “Artes de Cuba,” and each one is fashioned from a different combination of found materials: plastic bags, straw hats, carburetor hoses. In fact, Ledón designs her outfits with almost anything, provided she can find it in large enough quantities. When asked why she uses the materials she does, Ledón’s answer is simple. “Because they’re free,” Ledón tells Global Citizen. They’re free, but they can also be haute couture — and this approach just might be the future of sustainable fashion. In Cuba, where resources are always finite, upcycling is giving rise to a new generation of designers and entrepreneurs who are, quite literally, turning trash into treasure. And in a world where fast fashion is using up precious water resources, exploiting women and girls in poverty, and polluting the environment at a rate second only to the oil industry, designers like Ledón are not only creating fantastic outfits, they’re designing a better future, too. Just 35 years old, Ledón has turned what she calls her “obsession” with trash into a career. A graduate of Havana’s Instituto Superior de Diseño (Institute of Design), she now works as a costume designer at the Teatro El Público (Public Theater), and as a designer with Clandestina, the first independently founded Cuban fashion label. 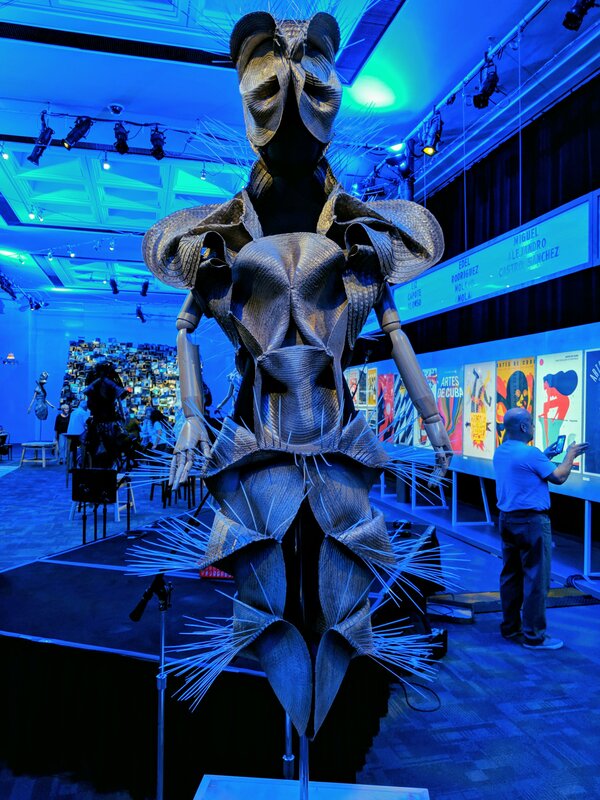 Last month, 10 of her eclectic designs were featured at the “Artes de Cuba: From the Island to the World” exhibit, which brought together more than 400 artists, musicians, dancers, and designers in Washington, DC. 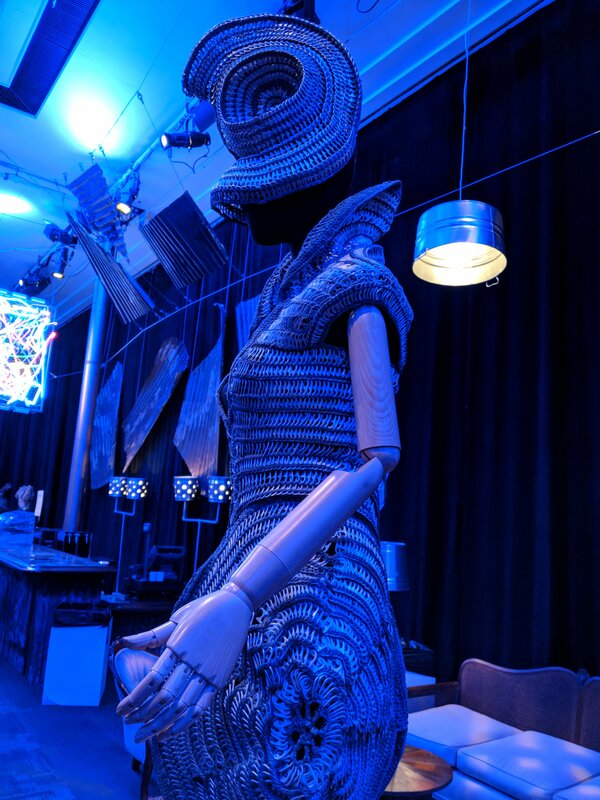 The centerpiece of Ledon’s exhibit, called “Little Black Dress,” is a towering 12-foot-tall dress made out of an assortment of found objects, including foam pool noodles, cables, fabric, nylon, plastic cable ties, rubber, secondhand clothing, wire, and plastic upholstery fabric. Ledón explains that she never had access to industrial workshops like the ones major industries use. “In Cuba, there are not industries like that. But I’m convinced that we can reuse a lot of things to make up for this,” she says. Ledón’s work, and her unique style, is, of course, also a product of her environment. In Cuba, designer items are at a premium, in part due to the US Embargo, which prevents new goods from being sold on the island, and in part due to the nature of the 1959 Cuban Revolution, after which fashion was “considered a tool for the upper class” by the Castro regime, according to a Racked interview with María A. Cabrera Arús, a postdoctoral fellow at New York University researching Cuban fashion. Cubans have embraced sustainable fashion not necessarily out of choice, but out of necessity, Navarro notes. “If they were to have easy access to global brands and fast fashion, they would not be necessarily inclined to buy sustainable products,” he says. In the absence of designer fashion labels, Cuba’s incipient fashionistas — Ledón included — are taking full advantage of the options at their disposal. The fashion brand Clandestina is at the forefront of this field. Founded in 2013 by designers Idania del Rio and Leire Fernández, Clandestina has ambitions to bring Cuban fashion to the global stage. “In that moment, it was either recycle or die." Clandestina didn’t start out making all of its clothes with recycled materials. In fact, the company initially imported cotton from the neighboring Dominican Republic, but stopped because the high import tariffs, Racked reports. “In that moment, it was either recycle or die,” she says. Currently, the company is collaborating with Ledón on a project called “Vintrashe” (vintage + trash, with a Cuban twist), producing shirts, notebooks, magnets, toys, bags, and other items entirely using recycled and donated materials. It’s been estimated that as much as 5% of the world’s greenhouse gas emissions come from the apparel industry. Each year about 10.5 million tons of clothing ends up in landfills — from the United States alone, The Atlantic reports. But the fashion industry has been thus far reluctant to change its ways. Worldwide, only a tiny fraction — about 0.1% — of recycled textiles collected by secondhand take-back programs are turned into new fabrics, according to H&M’s development sustainability manager, Henrik Lampa, who spoke with Newsweek. While it would be unrealistic to expect that a handful of Cuban designers can change this system, they are nonetheless setting an example for future generations of designers not just on the island, but around the world. But for Ledón, her designs are about more than just showcasing sustainability. They’re also about connecting people — and moving forward together. “In the end, we’re all the same,” she says. Global Citizen campaigns on the Global Goals for Sustainable Development, and climate action is Goal 13. You can join us and take action on this issue here.